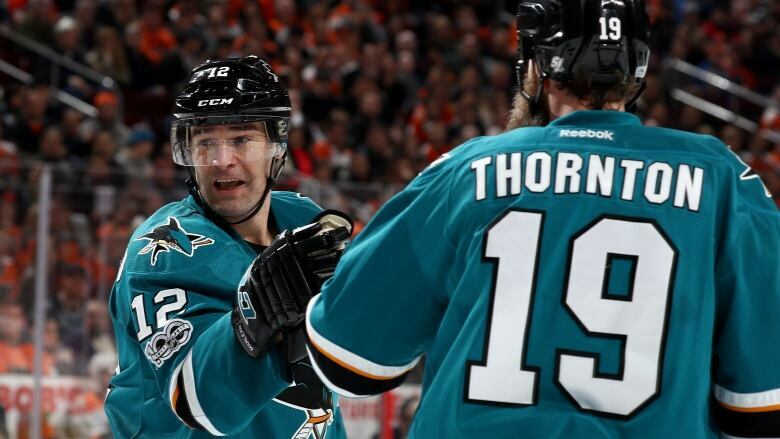 Where Thornton and longtime San Jose teammate Patrick Marleau will be playing remains an open question as they head toward unrestricted free agency. Joe Thornton is expected to be healthy at the start of training camp despite undergoing off-season surgery to repair torn ligaments in his left knee. "They've meant a lot to us, they mean a lot to us," general manager Doug Wilson said Friday. "It goes back to making this a place where players want to play. It's great when players want to be here, players of their ilk who have set the standard for everyone else. We're exploring it, trying to do everything we can to make the best decision for this franchise. They have choices also obviously. But they know how we feel about them." Thornton had a salary cap hit of $6.8 million and Marleau was at $6.7 million last season in the final year of three-year deals that were signed on the same day in 2014. Both players will be 38 at the start of next season, raising questions about how long the Sharks will want to commit and how much money they will be willing to pay. Marleau is coming off a 27-goal season and still has the speed to keep up with much younger players in today's faster game. Thornton scored just seven goals — his fewest in an 82-game season since his rookie year in 1997-98 — but is still an elite playmaker and had 43 assists. "Jumbo's doing extremely well," Wilson said. "He's been in here every day, looks really good. I don't think there's any doubt he'll be ready and fit to start the season. The work that he's put in already, that's pure Jumbo. He loves the game. I see him every day here at the rink." The two have been the faces of the franchise, with Marleau joining as the No. 2 overall pick in 1997 and Thornton being acquired in a trade from Boston on Nov. 30, 2005. San Jose has made three trips to the conference finals with both players on the roster and went to the Stanley Cup Final a year ago before losing to Pittsburgh in six games. Thornton recorded his 1,000th career assist last season and ranks in the top 25 all-time in assists (1,007, 13th place) and points (1,391, 22nd place). Marleau scored his 500th career goal last season and is 41st all-time with 508 in his career. More importantly, they have set the standard for scores of teammates in San Jose to emulate and have become fan favourites. But the decision on their future will be solely a hockey one not a marketing one, according to Wilson. "These guys have been cornerstones of this franchise. We operate under a cap system which is different from many, many years ago when those choices maybe come into play," Wilson said. "You sometimes have to make tough decisions. Make no mistake about our respect and appreciation for them will never end. Under a cap system we'll see and we'll navigate ourselves through this. We've been very fortunate to have players like this play at as a high a level as they have. How important they are to this franchise will not be forgotten. When it comes to making the hockey decisions, we have to make the decisions under this system, the cap system that makes sense." Wilson said he has a good idea who he will protect in the expansion draft but that could change depending if any deals are made with Vegas or another team. "We feel we're pretty comfortable," he said. "We know we're going to lose a good player. So is every team, so that's part of the expansion process. There's lots of talks, lots of communication. We do think we've prepared for this pretty well." The team has begun negotiating long-term extensions with defenceman Marc-Edouard Vlasic and goalie Martin Jones. The two are entering the final year of their contracts and can sign extensions beginning in July. The team has also begun interviewing candidates to replace assistant coach Bob Boughner, who was hired as the head coach in Florida. Wilson said he wants to find someone to specialize with the defencemen and penalty kill.